was born in 1955 to noble parents of the Bönbi Chöje: father Tshering Dorji, who was a descendent of the Tibetan King Trisong Deutsen, and mother Tshering Pelmo, in the region of Trongsa, Central Bhutan. The birth of the Tulku was preceded by numerous auspicious and miraculous signs such as the rainbow filled sky, untimely flowering of trees and plants. He is recognized as a great Dzogchen master of the Nyingma tradition – the ninth successive Body emanation of Pema Lingpa. At age of 16, he was formally enthroned as the 9th Gangteng Tulku at Gangteng Gompa, the traditional seat of the Gangteng Tulkus. This is his primary residence. After having spent the early part of his life in meditation retreat and study, since 1986 Gangteng Tulku Rinpoche have traveled around the world bestowing teachings according to the Nyingma tradition. Gangteng Rinpoche has been recognized as an embodiment of Pema Lingpa’s activity, and have dedicated his life to transmitting Pema Lingpa’s tradition and teachings to westerners. In Bhutan, Pema Lingpa is considered as the most important Master right after Guru Padmasambhava. This janitor, who got the empowerment at that time, is still doing the practice of Vajrakilaya. 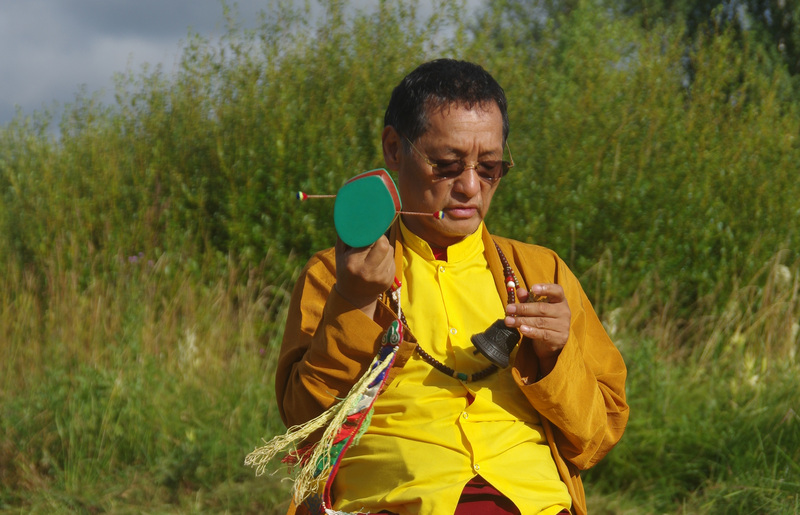 By now Rinpoche travels every year in Europe, North America and Asia. Rinpoche’s teachings concern essentially the view and practice of Dzogchen. He is responsible for the creation of retreat centers and Buddhist teachings in the West. Moreover, Rinpoche has founded the Yeshe Khorlo Centres. He sent three residents Khenpos or Lamas, Khenpo Karma Wangyel for Europe, Lama Dorje Lopon Phurba in USA and Lama Lopon Sangak Yeshe to Canada in order to spread the teachings of the Nyingma tradition and lineage of Pema Lingpa. (Gangteng Rinpoche in Umbusi 2017, blessing the land of the future retreat center).